Bermuda is an island located in the Atlantic Ocean, just less than 600 miles from the coast of the United States. 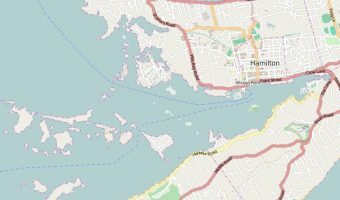 It measures only 21 square miles and is divided into 9 parishes and two municipalities; Hamilton (the capital) and St George. To see where Bermuda is in relation to the rest of the world, head to our interactive map and zoom out. The island boasts a rich history. It was discovered at the beginning of the 16th century by the Spanish and subsequently colonised by the British. Though still a British Overseas Territory, Bermuda has its own parliamentary system of government. One of the main drivers of Bermuda’s affluent economy is tourism. Most visitors come from the United States, Canada, and the United Kingdom. They are drawn by its great weather, beautiful beaches, golf courses, wealth of attractions, fantastic architecture, low crime rate, and a friendly local population. Around 60 percent of visitors to the island arrive by cruise ship. There are docks at Kings Wharf, St George, and Hamilton. Bermuda has only one airport, with scheduled flights to the US, Canada and the UK. Relaxed immigration policies mean that visitors from most Western countries do not need a visa to enter Bermuda for a vacation. The official currency is the Bermuda dollar, though US dollars are accepted and commonly used throughout the island. Visitors are not permitted to rent or drive cars, but the island boasts excellent bus and ferry services. Hiring a scooter is also popular. Bermuda is in the Atlantic Time Zone. 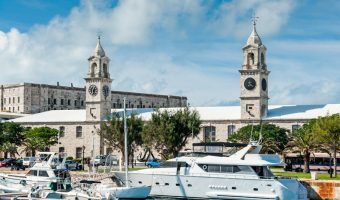 Find out the current time in Bermuda here. Interactive map of Bermuda showing hotels, attractions, beaches, golf courses, bus stations, ferry terminals, etc. Covers all areas of the island. Details of the official Visitor Information Centres. There are three permanent offices on the island where you can obtain free maps, bus and ferry timetables, brochures, guides, and more. 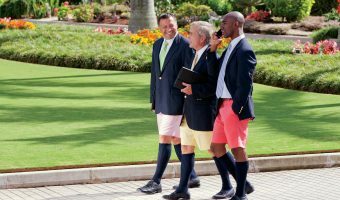 The national dress of Bermuda.